Read on my Kindle but also available as ePub from publisher Random House Australia. Her body was found floating facedown by the riverbank, and no one knows what happened. As rumours fly and fear grows, it seems that everyone suspects Lyndon, one of Amanda’s friends. He’s known for his temper, his cruelty and his criminal family – and now the police want to talk to him. It’s the end of summer, 1973, the heat is enough to melt asphalt and a sleepy riverside suburb is losing some of its innocence. Fifteen-year-old Winter went to the same school and hung out in the same places as Amanda. As she finds herself alone in trying to defend Lyndon, Winter learns that you can never really know someone – and the answers she has been looking for are closer than she has ever wanted to believe. The story is told in the first person by Winter Blair and is set on “the peninsula” which I mentally set in Victoria. Winter is the younger sister of Joe who was in Amanda’s class and was just one of the boys who had the “hots” for Amanda. 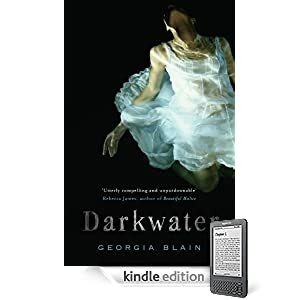 DARK WATER, once the police designate Amanda’s death as “suspicious”, becomes a murder mystery laced with threads about the perils of growing up. Winter becomes a self-appointed investigator, concerned first of all to prove that Joe could not be guilty of Amanda’s murder, and then extending her protection to his friends. In the background, Winter’s mother Dee is leading an environmental protest about saving Greenwood Bush from the predations of developers who want to clear the land for factory development. I’m far from an expert in young adult fiction but it seems to me that this age group would find DARK WATER a good read. Georgia Blain, an Australian author, has published five novels: CLOSED FOR WINTER, CANDELO, THE BLIND EYE, NAMES FOR NOTHINGNESS and the young adult novel DARKWATER. She was named one of the Sydney Morning Herald’s Best Young Novelists in 1998, and has been shortlisted for the NSW Premier’s Literary Awards. Two of her novels have been optioned for feature films, including CLOSED FOR WINTER, which was filmed as Elise in 2007. She has been published internationally, with her work appearing in publications such as Granta and The Independent Magazine. Her most recent book for adults BIRTHS DEATHS MARRIAGES was shortlisted for the Nita B Kibble Award in 2009.